Todays hair was something I hadn't tried before. It is quite simple, but looks like you put in a lot of effort. The great thing about a hairstyle like this is that it can go from day to night and still look good. It doesn't matter if it is a bit messy. I really liked the hair dare. It can sometimes be annoying because some days it is just easier to do a plain pony tail, but it really helps you to get out of your comfort zone. I would love to do another dare. I might try a lip dare, where I have to wear a different colour every day, a clothes dare. Is anyone else planning on doing the hair dare? WOW! Your hair is GORGEOUS! Though from what I have seen today (just found your blog today) your always looking amazing in your pics! This looks amazing! Would you mind doing a tutorial on it? :) Pretty please. 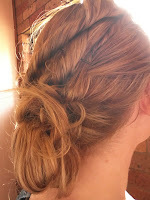 It looks lovely, I'm still planning on doing it but havn't yet! I am terrible! I'm going to be going away soon so I might do it then! That is super pretty! I second Ty, please show us how you did it! Oooh I really like this type of messy hairdo's. I'm pretty boring when it comes to my hair - straighten it everyday and done! Chelsea - Thanks sweet! :) That means a lot to me.